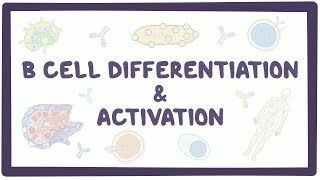 Osmosis: B cell activation and differentiation. (2019, April 20). Retrieved from (https://www.osmosis.org/learn/B_cell_activation_and_differentiation). Plasma cells, also called plasma B cells, plasmocytes, plasmacytes, or effector B cells, are white blood cells that secrete large volumes of antibodies. They are transported by the blood plasma and the lymphatic system. Plasma cells originate in the bone marrow; B cells differentiate into plasma cells that produce antibody molecules closely modeled after the receptors of the precursor B cell. Once released into the blood and lymph, these antibody molecules bind to the target antigen (foreign substance) and initiate its neutralization or destruction. Which immune cell is associated with a clock-face distribution of chromatin?